Many of us have gotten a whiff of a scent and been transported back to a memory or moment in time – and the associated emotions. But have you ever thought about how you can create scent in your space that helps improve your mood. Many of us customize our homes or workspaces to be exactly what we want aesthetically, organizationally or ergonomically, but thinking about how the space smells can really help to boost mood and make the time your family spends there more enjoyable. It’s not just a pleasant smell we’re after here. Aside from the specific memories that scent can trigger, your olfactory nerve, which is responsible for your sense of smell, is positioned close to areas of the brain that regulate emotion, emotional recall and memory. 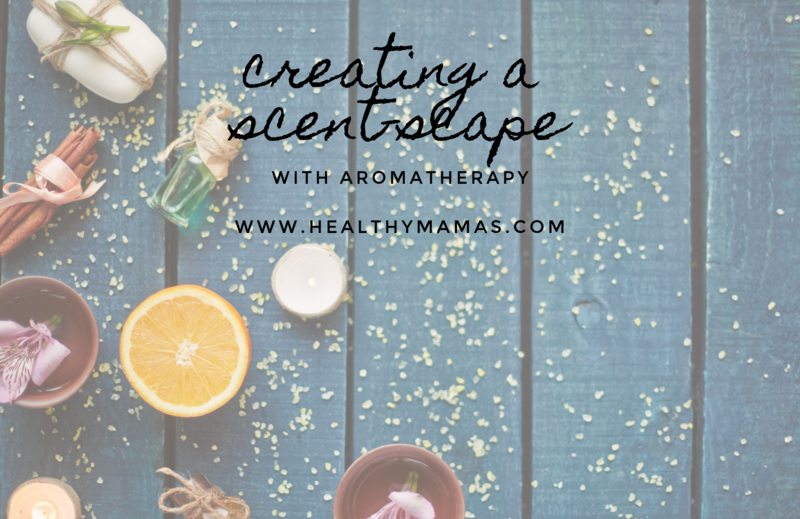 For the best way to create your very own “scent-scape,” essential oils are my go-to. The practice of using scents from essential oils to intentionally shift emotions and improve well-being is called aromatherapy. We’ve put together some of our favorite scents and their associated benefits. These scents can be inhaled using a room diffuser (a small, electronic device similar to a humidifier) or applied directly to your skin when appropriately mixed with a carrier like coconut or jojoba oil. It’s important to note that fragrance or parfum is different from essential oil. According to the Environmental Working Group, fragrance or parfum represents a mixture of various scent chemicals and ingredients–typically synthetic and produced in a lab. Pure essential oils are highly concentrated, potent extracts of plants produced through a steam distillation process. Buying pure oils and skipping synthetics is an important step in creating a “scent-scape” that is truly beneficial. Here are some of our favorite scents and their benefits. Experiment with them yourself to create the aromas that really suit your mood–whether that’s calm, focused, happy or relaxed! You can learn more about aromatherapy and the many different scents that affect mood in 52 Small Changes for the Family. Lavender – very common essential oil that can be easily faked with synthetic fragrance. Be sure your family is breathing the real thing to experience the relaxing benefits that Lavender oil offers. Choose a high quality brand such as NYR Organics or NOW. Geranium – a floral scented oil with sedative properties that can calm your mind and support healthy sleep. Buy from Garden of Life or NYR Organics. Peppermint – A favorite oil to have on hand for soothing headaches and body aches or pains, this oil can be diffused to keep you focused and on task. Buy from NYR Organics, Garden of Life or NOW. Lemon – Walk into a room sprayed with lemon essential oil and you instantly feel perky and invigorated. Try from Mountain Rose Herbs, NYR Organics or NOW. Rosemary – Known to be stimulating and refreshing, Rosemary oil can be combined with Lemon oil for a delicious smelling energy boost. Try NYR Organics or Garden of Life. Orange or Sweet Orange – Often used in household cleaners for its sweet, uplifting smell, Orange oil is sure to both enhance your family’s mood and keep everyone relaxed. Try from Mountain Rose Herbs, NYR Organics or Garden of Life.